No one knows when we'll spot life on another world, but everyone knows how it will happen. An unmistakable signal will be picked up by one of the antennas constantly listening to the sky as part of the SETI (Search for Extraterrestrial Intelligence) project. Or perhaps one of the rovers tooling about Mars will uncover a colony of bacteria living in the damp soil below the surface. Or maybe, well, something will land here and say hello. O.K., that last option may not be likely, but the other ones would be thrilling. Of course, the detection of extraterrestrial life need not be so direct  and certainly not so dramatic  to be one of the transcendent moments of human history. And astronomers have recently developed a new and nuanced way to conduct the hunt. The more exoplanets the Kepler telescope and Earth-based observatories discover circling distant stars, the likelier it is that they will soon spot a (relatively) Earthlike world moving in a balmy, water-friendly orbit where life as we know it is possible. Even when such a planet is confirmed, however, the most the exobiologists would have to work with is a tiny spot of light. It's hard to imagine how anyone could get much information from a speck like that. Hard for you and me, anyway. But astronomers tend to be a pretty clever lot, and a recent set of observations has proved just how clever: by looking at the moon, of all places, they've detected the presence of clouds, oceans and vegetation on Earth  a technique that could work similarly well on planets in deep space. What the astronomers were actually studying was earthshine  that is, sunlight that has reflected off Earth, then bounced off the moon and back into ground-based telescopes on Earth. You can see earthshine whenever there's a new moon, faintly illuminating the lunar disk even when it's lost in shadow. The earthshine striking the moon is not pure sunlight that simply bounced from our world into space as if were ricocheting from a mirror. Rather, it becomes altered by having reflected off the Earth's clouds, oceans, land and atmosphere. Michael Sterzik of the European Southern Observatory used the Very Large Telescope in Chile to study this phenomenon, analyzing the makeup of the light coming back to us from the moon. Some of those subtleties, he and his colleagues report in a recent issue of Nature, revealed the presence of molecular oxygen and methane in Earth's atmosphere. Those gases can't survive for long unless they're constantly replenished  and life is one of the major replenishers. Sterzik and his colleagues also saw that some of the reflected sunlight showed signs that it had bounced off vegetation. The astronomers also looked at polarization  a change in the way light waves vibrate. To drastically oversimplify, imagine holding one end of a jump rope that's tied at the other end to a doorknob. If you shake your end vigorously side to side, you'll create waves that are horizontal, parallel to the floor. If you shake it up and down, the waves will be vertical, parallel to the walls. 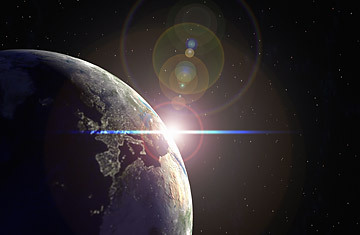 Light waves from the sun vibrate in all directions, but when they bounce off the planet's surface or off water molecules in Earth's atmosphere, they get shuffled preferentially into some planes of vibration. By looking at how the reflected light was polarized, the astronomers could see what percentage of Earth (the side facing the moon at the time, anyway) was water, how much was plant matter and how much was clouds. Presumably, as Earth rotated, they could have watched these percentages change as different faces of our home planet entered the moon's view. The idea of using earthshine this way is not entirely new. With the help of the moon, an Australian astronomer named Sally Langford effectively discovered Africa, using what amounted to an amateur telescope to watch how the brightness of the light reflecting back to us brightened when the Indian Ocean was facing the moon and dimmed when the African land mass replaced it. In the case of an exoplanet, we would not have to rely on one of its moons to reflect its light and throw it our way. Studying the wavelengths and polarization of the planet directly would be sufficient. But we would not know what to look for or how to measure it if we hadn't been able to prove and practice the technique with the one world we know that has life  and its little moon that has none.